Would you like to feel more confident that your breath is fresh? When did you last see a dental hygienist, not just the dentist? I recently joined as a new patient on a friend’s recommendation that I see Nich McAulay. It was the best dental experience that I have had. Well worth the hour+ journey from east London. Very professional and incredibly helpful in explaining all options (and reasons) fully. Bacteria accumulate under the gum and between the teeth where even regular brushing and flossing cannot remove it, and most people still don’t brush the correct areas, namely between the back teeth. 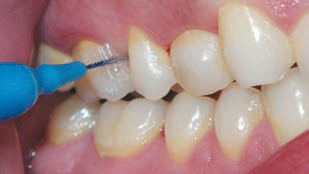 Push an interdental brush in and out between your back teeth. Bleeding indicates gum disease; healthy gums never bleed. Smell the brush. If it smells bad you may have bad breath. 68% of bacteria are between the teeth and below the gum and are not accessible to manual or electric tooth brushing. Bad breath. Causes and Management. Bad breath largely originates in the mouth due to poor tongue hygiene and gum disease. It also can originate in the nose, nasal passages and sinuses. Each has a characteristic smell which is easily diagnosed by a professional. Treatment depends on the cause. Mouthwash alone does not work. Sufferers are usually oblivious as the subject is largely taboo, but help is easily found with dentists who work in this field. Dr Stevenson-Smith has worked in this field for over 20 years with a simple step by step approach. Diagnosis of origin of bad breath. There may be multiple causes. Elimination of all odour causing bacteria by instructing patients in ideal home routine. Elimination of gum disease where present. Treatment can involve several hours of cleaning below the gums. Local anaesthetic is used for this procedure to make it comfortable. Referral to ENT specialist if bad breath coming from nasal passages, sinuses (or rarely the tonsils). Bad breath often evokes a reaction characteristic of disgust among those who interact with bad breath sufferers. This is a natural defensive reaction designed to protect the body from potential sources of disease: The major chemical compounds of bad breath are the same as those emitted by rotting food (Putrescine), faeces (Skatole), and even dead bodies (Cadaverine), all potential sources of disease and infection. In most cases (85-90%), bad breath originates in the mouth itself. The intensity of bad breath differs during the day, due to eating certain foods (such as garlic, onions, meat, fish, and cheese), obesity, smoking, and alcohol consumption. Since the mouth is exposed to less oxygen and is inactive during the night, the odour is usually worse upon awakening (“morning breath”). Bad breath may be transient, often disappearing following eating, brushing one’s teeth, flossing, or rinsing with specialised mouthwash. The bacteria growing below the gum line (sub-gingival dental plaque) have a foul smell and contribute to bad breath if not removed. Signs that you have gum disease are bleeding on brushing or flossing, inflamed looking gums, bad breath. A simple test is to floss deeply around a back tooth. If it either bleeds or smells then you have gum disease and should get treatment. A quick scale and polish by a dentist will not eliminate gum disease. Patients with a history of this type treatment are often surprised to find that they have gum disease that requires several hours of treatment by a dental hygienist. The most common location for mouth-related halitosis is the tongue. Large quantities of naturally-occurring bacteria are often found on the posterior dorsum of the tongue, where they are relatively undisturbed by normal activity. This part of the tongue is relatively dry and poorly cleansed, and bacterial populations can thrive on remnants of food deposits, dead epithelial cells, and postnasal drip. The convoluted microbial structure of the tongue dorsum provides an ideal habitat for anaerobic bacteria, which flourish under a continually-forming tongue coating of food debris, dead cells, postnasal drip and overlying bacteria, living and dead. When left on the tongue, the anaerobic respiration of such bacteria can yield either the putrescent smell of indole, skatole, polyamines, or the “rotten egg” smell of volatile sulphur compounds (VSCs) such as hydrogen sulphide, methyl mercaptan, Allyl methyl sulphide, and dimethyl sulphide. The most widely-known reason to clean the tongue is for the control of bad breath. Methods used against bad breath, such as mints, mouth sprays, mouthwash or gum, may only temporarily mask the odours created by the bacteria on the tongue, but cannot cure bad breath because they do not remove the source of the bad breath. In order to prevent the production of the sulphur-containing compounds mentioned above, the bacteria on the tongue must be removed, as must the decaying food debris present on the rear areas of the tongue. Most people who clean their tongue use a tongue cleaner (tongue scraper), or a toothbrush. There are over 600 types of bacteria found in the average mouth. Several dozen of these can produce high levels of foul odours when incubated in the laboratory. The odours are produced mainly due to the breakdown of proteins into individual amino acids, followed by the further breakdown of certain amino acids to produce detectable foul gases. For example, the breakdown of cysteine and methionine produce hydrogen sulphide and methyl mercaptan, respectively. Volatile sulphur compounds have been shown to be statistically associated with oral malodour levels, and usually decrease following successful treatment. Other parts of the mouth may also contribute to the overall odour, but are not as common as the back of the tongue. The second major source of bad breath is the nose. In this occurrence, the air exiting the nostrils has a pungent odour that differs from the oral odour. Nasal odour may be due to sinus infections or foreign bodies. Some one quarter of the patients seeking professional advice on bad breath suffer from a highly exaggerated concern of having bad breath, known as halitophobia, delusional halitosis, or as a manifestation of Olfactory Reference Syndrome. These patients are sure that they have bad breath, although many have not asked anyone for an objective opinion. Halitophobia may severely affect the lives of some 0.5-1.0% of the adult population. Scientists have long thought that smelling one’s own breath odour is often difficult due to acclimatisation, although many people with bad breath are able to detect it in others. Research has suggested that self-evaluation of halitosis is not easy because of preconceived notions of how bad we think it should be. Some people assume that they have bad breath because of bad taste (metallic, sour, faecal, etc. ), however bad taste is considered a poor indicator. For these reasons, the simplest and most effective way to know whether one has bad breath is to ask a trusted adult family member or very close friend (“confidant”). One popular home method to determine the presence of bad breath is to lick the back of the wrist, let the saliva dry for a minute or two, and smell the result. This test results in overestimation, as concluded from research, and should be avoided. A better way would be to lightly scrape the posterior back of the tongue with a plastic disposable spoon and to smell the drying residue. Another is to floss your back teeth and smell the floss. If it is unpleasant this would indicate that you have gum disease. Although there are several laboratory methods for diagnosis of bad breath, the most important measurement of bad breath (the gold standard) is the actual sniffing and scoring of the level and type of the odour carried out by trained experts. Bad breath originating from the mouth smells differently from that originating from the nasal passages and sinuses. Brush or scrape the body and the back of the tongue until all the bacterial debris has been removed and the tongue looks pink. Brush your teeth for two minutes. Floss your teeth under the gums. Rinse with oxidising or alcohol-free antibacterial mouthwash. Rinse mouth with water throughout the day. Elimination of gum disease where present. Referral to ENT specialist if bad breath is coming from nasal passages, sinuses (or rarely, the tonsils). As the amount of cleaning that teeth and gums require varies from patient to patient, at Marshgate you can now choose the best treatment for you. We have introduced air polishing for superior stain removal and longer appointment times to enable you to have the best cleaning experience ever. The standard treatment to keep your gums healthy and your breath fresh. Includes ultrasonic and hand scaling and regular polishing. A longer appointment with additional air polishing. This uses a stream of ultrafine silica particles for superior stain removal and is followed by high gloss diamond polishing for a super smooth feel. Treatment of bleeding gums and bad breath. Elimination of periodontal pockets. Extensive removal of infection (dental plaque and calculus) from the root surfaces under the gums. Root planning done under local anaesthetic with topical antibiotics. Treatment of deep fissures to prevent decay and of early cavities to prevent further decay. Every large cavity started as a small one. No injections or drilling are required. Recommended for all children’s permanent molars and early decay in adults.